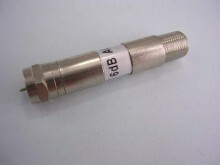 F type attenuator to cut signal and reduce overloading. F male to F female making it extremely simple to install in line prior to an amplifier or booster. Click the button below to add the F Type Attenuator 6dB to your wish list.